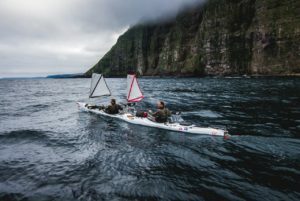 Olly Hicks and George Bullard kayaked from Greenland to Scotland. Their 22 ft tandem sea kayak was customized to allow them to lay flat in the cockpits and rest during the long crossings. From Greenland they paddled to Iceland then made their way along its northern coast before starting the 4 day and 4 night paddle to the Faroe Islands in a notorious stretch of water known as the devil’s dancefloor. During their final crossing to Scotland, exhausted and with a closing weather window, they stopped short at North Rona the most remote island of the British Isles. After a short weather delay they landed on the coast of Durness Scotland after 6 weeks and 1200 miles of paddling. You can learn more about The Greenland to Scotland Challenge as well as Olly’s other adventures at his website ollyhicks.com. Olly Hicks, welcome to The Pursuit Zone.